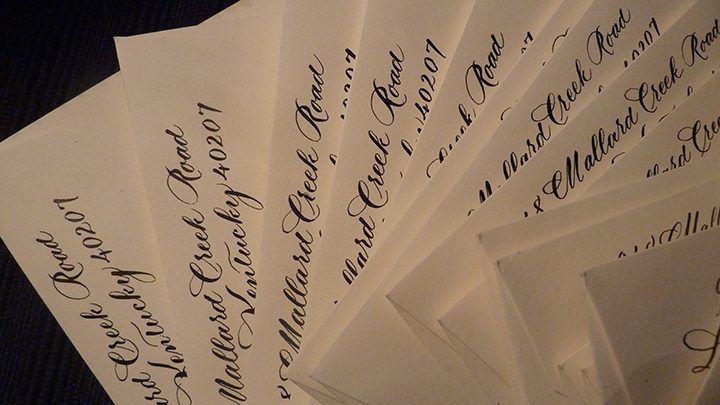 Below are some of my favorite and most requested lettering styles for envelopes and invitations. The understated elegance of my classic script. These are in a modified Citadel style. Type fonts such as Citadel were usually designed by a calligrapher, but are not always easily reproduced in pen and ink. Therefore, when I emulate a font, I modify it to better suit my hand lettering. This is a naive or whimsical style of lettering. It is less formal with a young and untrained look. Return address service available. 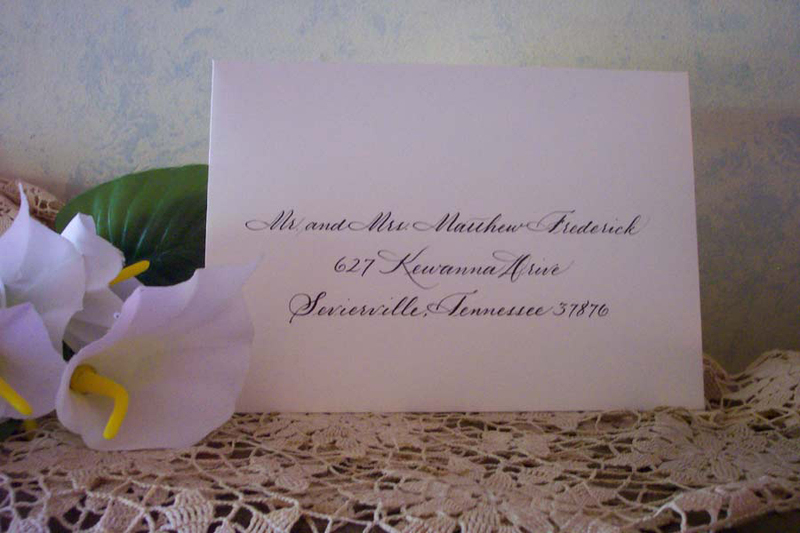 In the past, your local stationer knew how to guide you through the process of ordering your wedding invitations. With the new availability of online ordering, sometimes no one reminds you to have the return address printed. I'm happy to do it, but it's less expensive for you to have it done when you order your envelopes. Let me take the worries out of this part of your wedding planning and preparation. It's what I do. Envelope stuffing and mailing service available. I'll be happy to add this service to your order, but when you order stamps, be sure you have taken a complete wedding set to your post office for weighing and sizing. 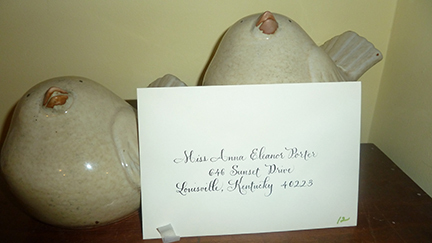 Square envelopes and oversized envelopes and heavy invitation sets will require added postage. It's better to plan ahead, especially when you are ordering special stamps. 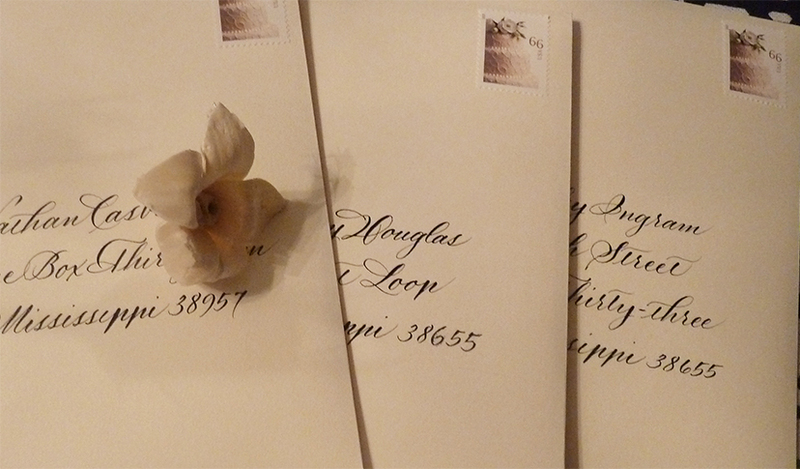 There are hundreds of ways to address envelopes. We'll be happy to work with you to make yours uniquely yours. The envelope creates the first impression - let's make it special! 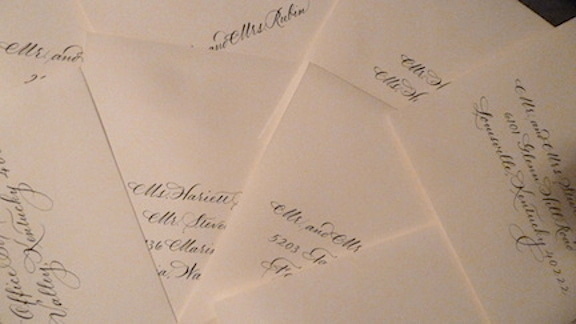 Did you know that traditional wedding etiquette requires that envelopes be addressed by hand, and not with labels, computers or typewriters?